That other white rose is a beauty too! At daylight this morning my flight from Ecuador was landing in Ft. Lauderdale, and three hours later a second flight bobbed in and out of Tampa, and now I am in New Orleans to take care of some visa paperwork… It ws nice seeing Tampa from the air – so many trees! That was a great sight. last flight I was on. It was wintertime and there was lots of snow! this one is really good…………….what we can tell about a person by just taking a moment to really see……. 🙂 Bless You Eddie. Many blessings to you Wendi on this fine day! thank you……..it is a beautiful day here too…….sunny and and in the low 70s. perfect. Such an amazing photo and perfect words! 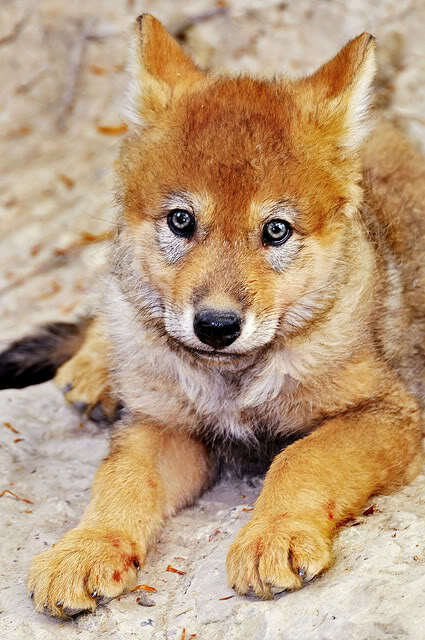 Easy to fall in love with this red wolf pup, those big eyes will get you every time! So true, one may not want to approach him unless he is happy to see you. Pure sweetness 🐶sending you joy Eddie ☺️💫🤗 have a happy day! Days of happiness flow one to another with your kindness! Eye contact seems to be almost none existent these day anymore, friend Ian … We used to converse in person and make eye contact and learn to know each other that way … But these days many people are too busy looking into their i phones and social media apps instead into their fellow human being’s eyes. I now slowly understand my mom (age 89) saying: “I ‘am ready to leave this world anytime.” Much love, cat. Eye contact? These days it seems ‘texting’ has replaced the usual phone call, when you actually could ‘hear’ the person’s voice! We are fast becoming a society removed from any personal contact. Wonderful picture and a fitting quote! Loved it. Thank you very much! Have a great day today Tiny! Good morning Sylvia and thank you, enjoy your day!